I find it completely odd and baffling that you would be able to go to a restaurant, eat a relatively large meal but leave the restaurant feeling hungry. Not like starving hungry but hungry enough to ponder the question of, “Did we eat yet?” Is this really a possible thing or is it simply a matter of, mind over matter? As I ponder this question, there is one location that immediately comes to mind. A location that I have left there, time and time again, asking myself, “Did we eat yet?” The name of this location you may ask? None other than Cracker Barrel. Normally located close to the highway, and sporting large gift shops, Cracker Barrel always leaves me wondering…Did We Eat Yet? We have a Cracker Barrel in Naples that we frequent maybe 2 or 3 times a year. Every so often, the meal will just sound really good and we will decide to go. On our last visit, we were on our way home from a Marlins game a few weekends back. We arrived to Naples at dinner time on a Sunday and decided to stop on it. This was my first visit to the restaurant in, jeez, probably close to a year. We were greeted with the traditional gift shop and nice service. We were seated and served drinks rather quickly. Cracker Barrel is a place where I order exactly the same thing every single time I go, so the menu is really a no brainer for me. My go-to order at the Barrel is the Grilled Chicken Tenderloin with America Cheese. For my 3, yes I said 3, sides, I go with a side salad, carrots and corn. We placed our orders and my salad came just a few moments after. 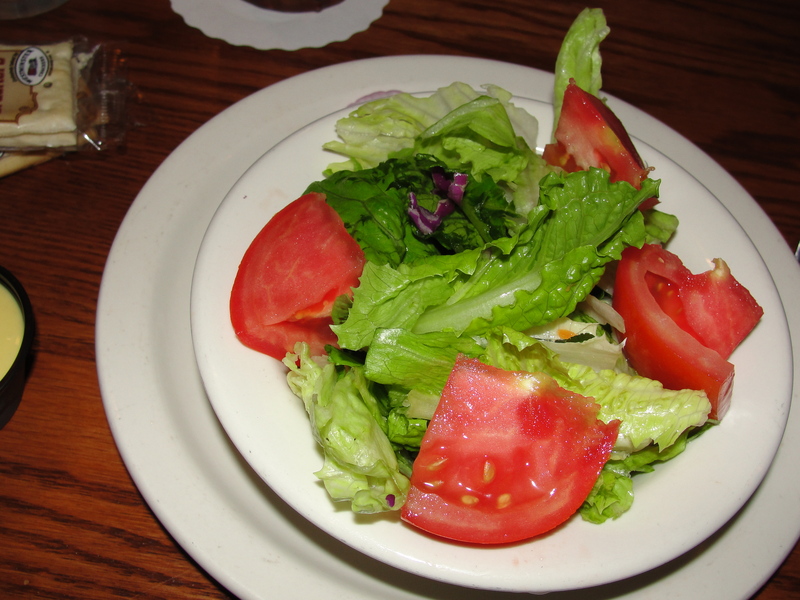 The salad consists of 3 components – lettuce, tomatoes and red onions. I remove the red onions immediately and apply a bit of honey mustard dressing to the salad. I love how basic and simple the salad is. The lettuce is always very fresh and crispy and, the tomatoes are chunky and ripe. The addition of honey mustard ties all the flavors together. The Barrel also serves a package of crackers with the salad, which I eat in no time at all. A nice, delicious start to my meal. Filling? No, but, it is just a salad. On this visit, our food arrived moments after I finished my salad. In addition to our meals, we were also served biscuits and cornbread. I am not a huge fan of the biscuits or cornbread at the Barrel but, did have a biscuit on this visit. The biscuit was warm and quite soft. I did not apply any butter to the biscuit but this is quite normal for me. 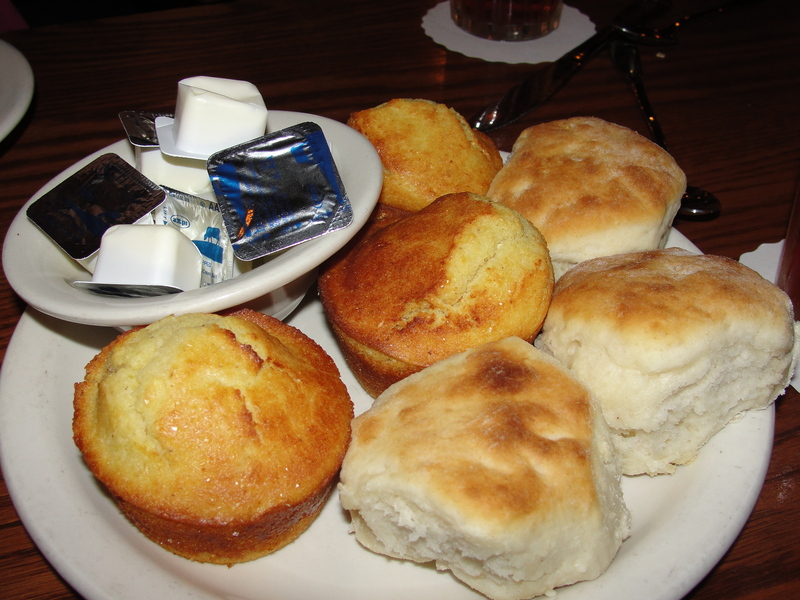 I find the biscuits at the Barrel to be very, very, very thick – you can not eat more than a bite of the biscuit without a sip of your beverage. This is kinda what kills it for me with the biscuits. Yes, they are good but boy, they sure are thick. Okay, now for the main attraction. The grilled chicken is served in 6 pieces of varying size. None of the pieces are big or thick in the least. On top of all of the pieces, lays a piece of melted American cheese. While the chicken itself is pretty thin, it has some great flavor. Not the traditional grilled flavor but rather a more buttery, toasted flavor to it. The addition of the American cheese, forms a buttery-cheesy piece of perfection. I like to dip my grilled chicken into honey mustard – delicious. The honey mustard dressing is cold and only a little bit sweet. Mixed with the warm, buttery taste of the chicken is quite delicious. As for the sides, you can’t really mess up corn or carrots. The corn is just plain old, out of the can corn. Nothing bad here. As for the carrots, they are cooked to the point of being soft but not mushy. I enjoy varying bites of corn & carrots with my chicken and honey mustard. Sometimes I even get a little crazy and dip some of the carrots into the honey mustard. 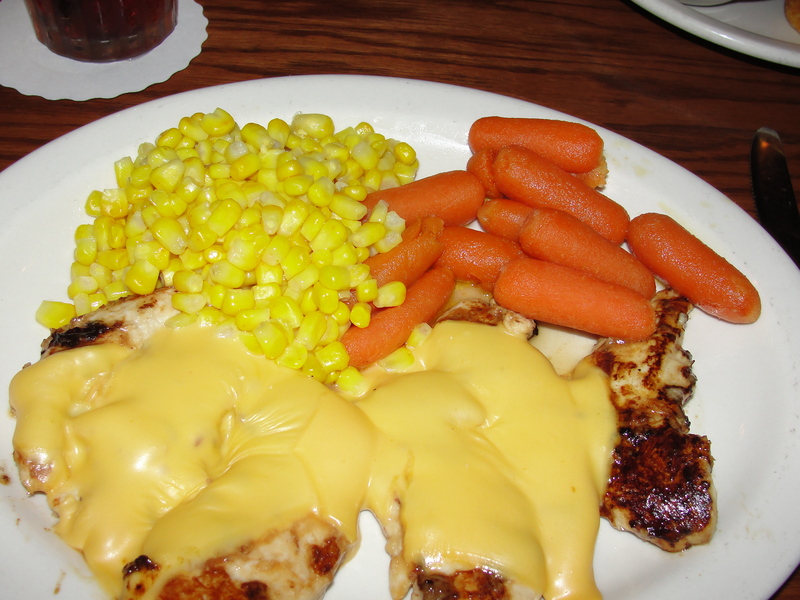 While neither the corn or carrots are served in large portions, there are plenty of each to go with the chicken. I cleaned my plate with no problem at all. After finishing, I feel as if maybe I am full. It is not until I actually leave the restaurant when the impending doom of Did We Eat Yet hits me. I wish I had a better idea of why this is because it really is quite baffling. While the Barrel is nothing all too exciting, I find that I always get good food and good service. Perhaps if I left there full, I would have more of a reason to go back. I would say that this is just me, my issue, my battle to win but, I know for sure that it is not. Not only do I leave with this feeling but so does the rest of the family. Does the same thing happen to you? Are you left with the pondering question and the desperate search for this age-old question? Cracker Barrel serves up good old fashion cooking and, I guarantee, you will leave asking yourself one thing – Did We Eat Yet?